We’re right in the middle of October. Here in New England, the leaves are changing, the weather is crisper, and it’s prime time for apples! In fact, October just happens to be National Apple Month, and rightly so. With so many luscious varieties available, it would be a shame not to indulge and reap the health benefits of apples. • About 2,500 varieties of apples are grown in the U.S., and 100 varieties are grown commercially. • Apples were the favorite fruit of the ancient Greeks and Romans. • The size of apples ranges from roughly the size of a cherry to the size of a grapefruit. • The top 10 apple varieties sold in the United States are Gala, Red Delicious, Fuji, Granny Smith, Honeycrisp, Golden Delicious, McIntosh, Cripp’s Pink Lady, Braeburn, and Jazz. • One of the oldest varieties of apples in existence is the Lady apple. • A food-grade wax is applied to many varieties of apples after harvesting. • Apples ripen 6–10 times faster at room temperature than in the refrigerator. I could go on about apples! Who knew that there was so much to know about them? In addition, apples contain vitamin C, and a number of phytonutrients, including quercetin, kaempferol, myricetin, and chlorogenic acid. Anthocyanins are what gives apples their red color. Don’t worry if the names are unfamiliar; what’s important to know is that these natural substances provide a number of health benefits. Apples contain soluble fiber. This type of fiber turns into a gel during digestion. It can “trap” cholesterol and help excrete it, causing blood levels of cholesterol to drop. Also, soluble fiber can slow the rise in blood sugar after a meal, preventing those annoying blood sugar “spikes” that you may sometimes notice. Apples are filling. Thanks to its fiber content, an apple is a great choice as part of a meal or as a snack, because it fills you up — always a plus when you’re aiming to lose weight. By the way, in one study, women who ate a cup of dried apples every day for a year lost weight and lowered their cholesterol at the same time. It’s likely that eating a fresh apple could lead to the same results. Apples may help you live a longer life. According to results from the Iowa Women’s Health Study, eating apples was linked with a lower risk of death from heart disease. And in another study, apple eaters had the lowest risk of having a stroke compared to non-apple eaters. Why? It’s likely due to the combination of apples’ soluble fiber and antioxidants that lower cholesterol and reduce inflammation. Apples can fight metabolic syndrome. Metabolic syndrome describes a cluster of signs and symptoms, including high blood lipids and high blood pressure, that, if not caught and treated, can lead to diabetes and heart disease. The National Health and Examination Survey (NHANES) study showed that people who had eaten apples in any form over the past day were 27% less likely to have metabolic syndrome. Apples keep you going longer. Need an exercise extender? Eat an apple! Remember quercetin (mentioned above)? This phytonutrient helps make more oxygen available to your lungs, which can help you keep going, longer (think Energizer Bunny!). Apples boost lung health. Eating fruits and vegetables has been show to lower the risk of lung cancer; however, apples are the shining star here. Research hasn’t come up with the exact reason, but it’s likely that apples’ anti-inflammatory properties play a role. Add this to the list of benefits, too: Eating apples may help to decrease the risk of asthma attacks. Apples enhance gut health. More and more research points to the role of “good” bacteria, or probiotics, in fighting a host of health problems, including obesity, diabetes, heart disease, and digestive woes. Eating apples can help increase the number of healthy bacteria in your gut. No matter what type of apple you prefer, select apples that are firm, smell nice, and are free of cuts and bruises. Refrigerating apples helps to slow ripening, maintains flavor, and preserves nutrients; a cold storage area in your cellar works well, too. • Spread apple slices with peanut or almond butter for a filling, blood-sugar-healthy snack. 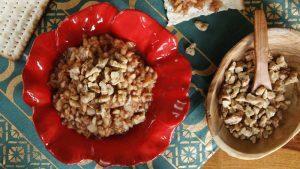 • Add diced apples to a salad for crunch and flavor. • Satisfy a sweet tooth by eating an apple with a small amount of dark chocolate. The combo of antioxidants in both of these foods helps fight heart disease. • Bake an apple in the oven, and sprinkle it with cinnamon and/or nutmeg. Top with a dollop of Greek yogurt or frozen yogurt. • If you’re a smoothie fan, throw a chopped apple into the blender for an instant antioxidant rush. 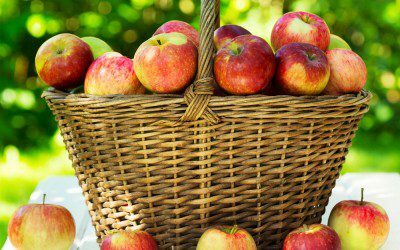 With so many different types of apples to choose from, along with the health benefits that apples provide, make apple-eating part of your fall routine. Go apple picking today! Women with diabetes today have many positive role models to choose from, says Amy Mercer. Bookmark DiabetesSelfManagement.com and tune in tomorrow to learn more.